If you like your cats and you like wildlife, do them both a favor and keep your cats inside. Cats live longer, healthier lives as indoor cats, and wildlife and your neighbor’s vegetable beds benefit from not having your cats roaming the neighborhood. Study after study demonstrates not only the adverse effect that house cats have on wildlife (from song birds to the endangered Florida panther), but how far your seemingly lazy, well-fed little friend actually travels. Also, study after study finds how much shorter cats lives are when they are allowed to roam. Cats are curious and like to look outside, and watch birds, people, leaves, whatever, and we try to provide them with ways of doing just that. 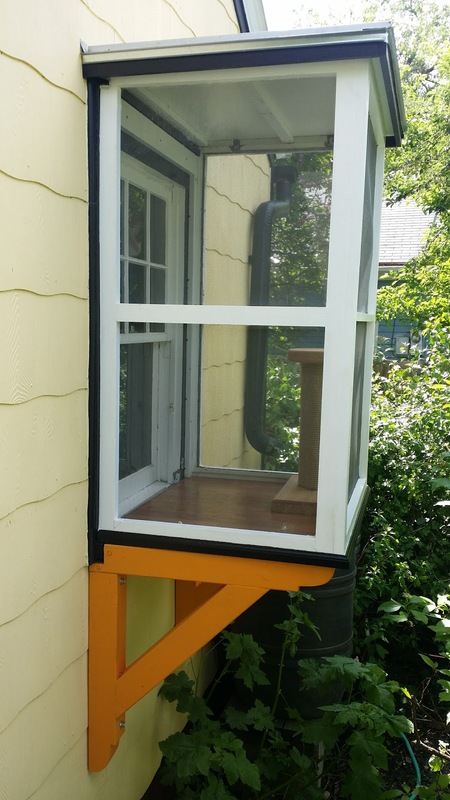 One minor thing I did was add a window to one of our storm doors, so they can look out when the door is closed. 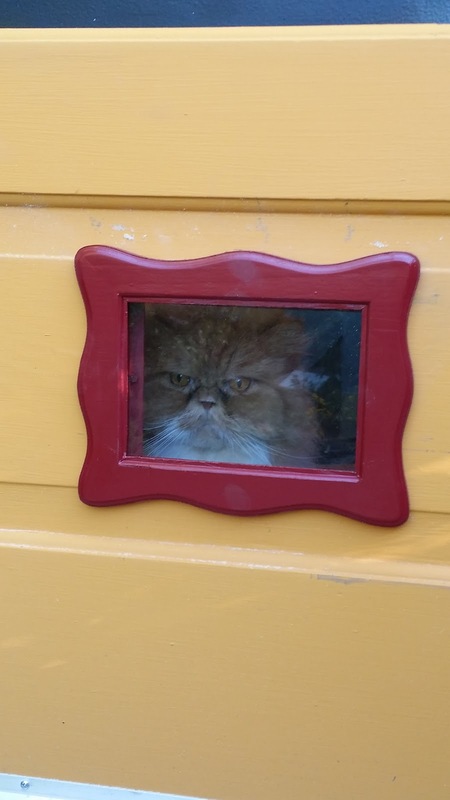 Chester is dissatisfied with just a window. 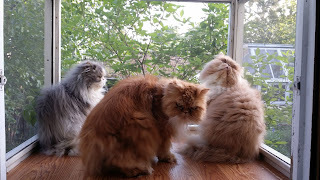 They use the window a lot, but they also would like to spend more time enjoying the sights, sounds and smells of the garden. 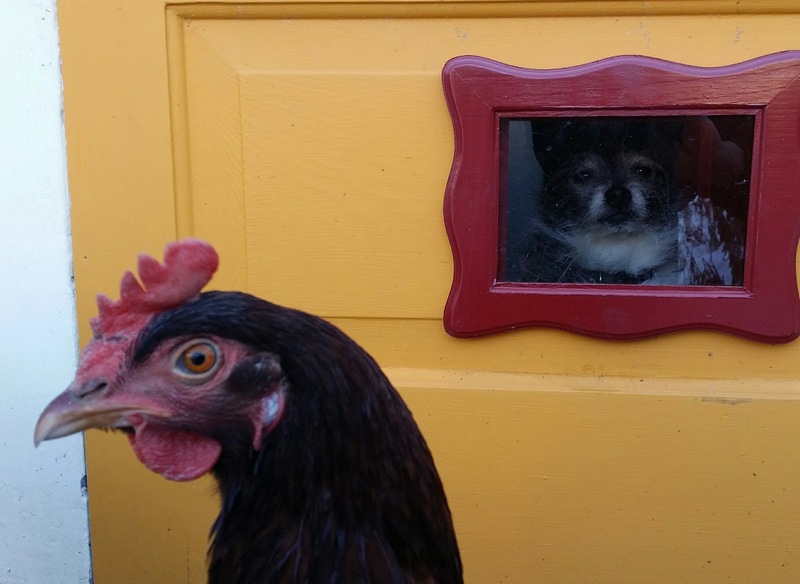 The window looks both ways and is effective for not just cats, but chickens and Chihuahuas. Winston gets supervised time in the garden (the only one of our cats that does), but it is seldom and I know he likes to feel the wind in his hair, so that lead to my recent project- a Catio (“cat” + “patio” = awesome). 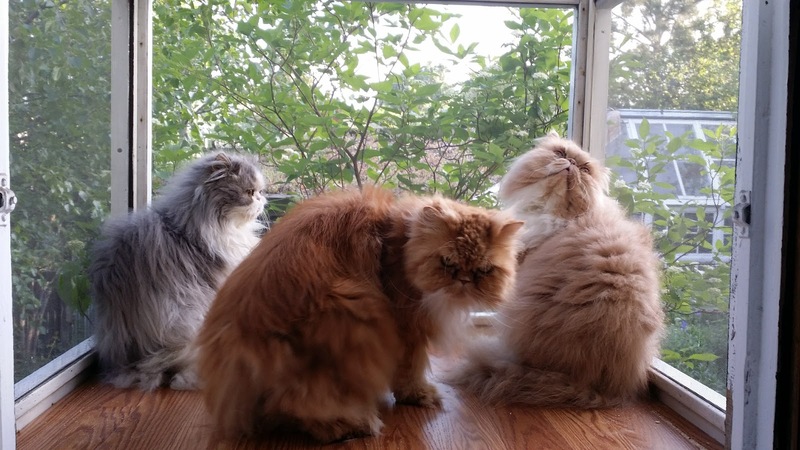 From left to right, Winston, Chester and Gary investigating their new Catio. 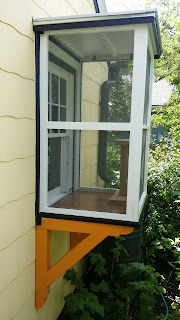 I first learned about a Catio a few years ago from an announcement for a Catio Tour in Portland. I was intrigued. The fifth annual tour is scheduled for September 9. This was a fun project and one that I could get all the materials from Home ReSource (using reused and repurposed materials is one of my passions). 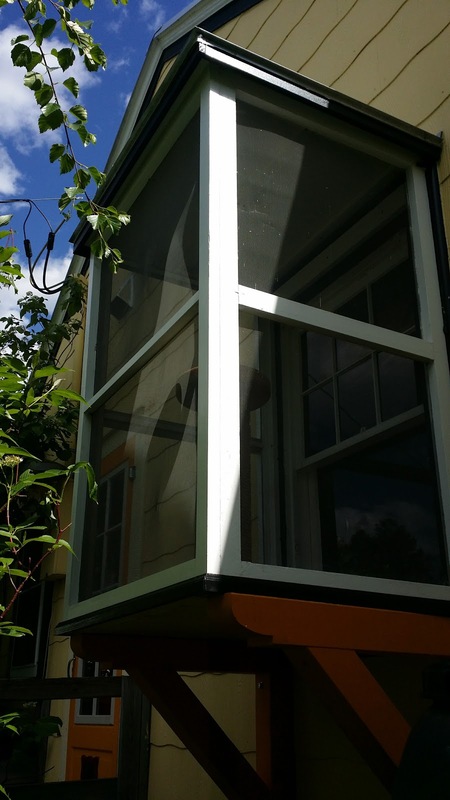 This Catio is made from 3 wood frame window screens and these screens are common at Home ReSource. 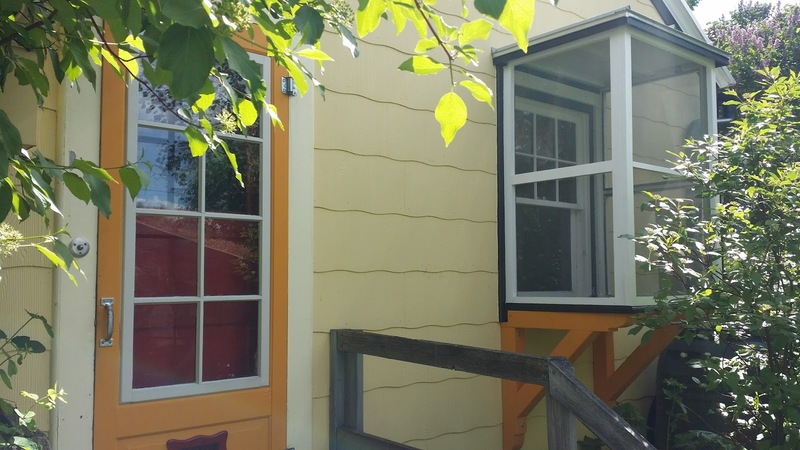 These window screens sell for about $3 each and they are a common byproduct of people upgrading their windows in Missoula. They were really common on the vast amount of homes built here between the 1910’s and the 50’s. It is nice to find a use for a common thing like these (and hollow core doors, but that is another issue). The rest of the Catio is constructed from 2x stock reclaimed from homes), plywood from shipping crates, reused lag bolts, screws, and the brackets (above) are re-purposed fence posts. In all this project cost about $35. It is not totally complete, I plan to add a shelf (a second floor) for the cats to lounge, but I wanted to see how that enjoy and use the current space. One of the nice things about this project is that it is portable. 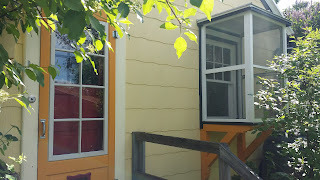 Ultimately, we plan to install French doors in place of this window. 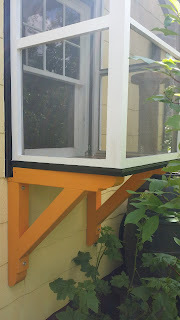 When we get around to that project (or “if”), we can move this to another window. This will allow our cats some time to spend outside but protects them, and protects our wildlife visitors from them. Wow! What a great little invention! And at a cheap price too! 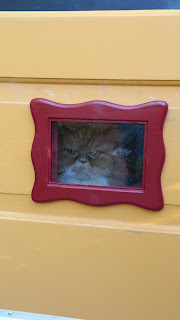 Our cat loves the outdoors but we feel the same way about leaving her out. We often feel bad that we don’t let her roam around outside. I think you’re right in that they just want to feel the air and wind against their faces and hair. This is great idea. This is a really cool project. One I might even feel qualified to undertake! Ginger gets supervised time outside, but I'm thinking she's the end of the line I won't do that with my next cats. This would be a nice alternative to offer them. Heh, Chester's expression if awesome!